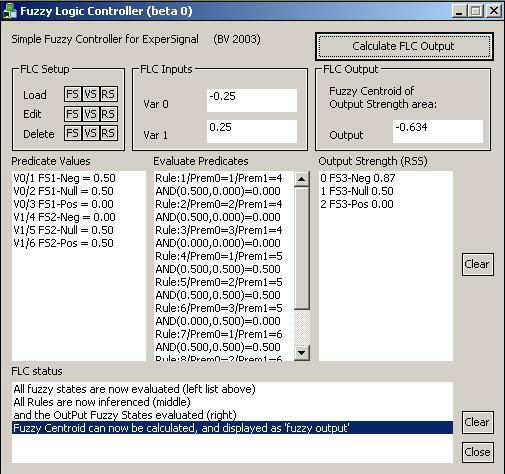 This FLC was originally designed to provide the simplest Fuzzy Logic controller possible in MS VC++. It is therefore highly recommended to read it to understand this implementation. This can be done simply from the “Start – Run” command line, or type CMD to open a DOS-like window. This is a quick user guide; a separate FL design guide will follow. Note: The underlying classes are more versatile than this dialog based example can show. In this implementation, the FLC is limited to 3 fuzzy variables: 2 inputs and 1 output. 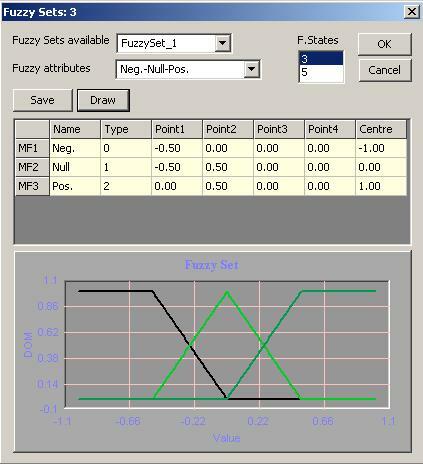 The first component is a collection of Fuzzy Sets (FS). In a nutshell, a Fuzzy Set is itself a collection of Membership Functions representing common fuzzy states, like “Low”, “Average”, “High” or “Negative”, “Null”, “Positive”. Semantically, a fuzzy set is linked to the variable it will be associated with, but it is a separate object nonetheless. The second component is a collection of fuzzy variables (VS). The object model allows for any number of variables, but this implementation assumes 2 inputs and 1 output. As said above, each variable is associated to a fuzzy set. In the current implementation, the FLC uses 3 variables: 2 inputs and 1 output, all associated with a Fuzzy Set consisting of 3 Fuzzy States. The Rule Set is completely defined with a 3 x 3 rule matrix. A new FLC object is instantiated when the dialog is loaded. The FLC is empty, i.e. it has no FS, no VS and no RS. It is therefore necessary to create them first. Note that these buttons instantiate the necessary appropriate objects, and load default values as per the Seattle Robotics tutorial, the only difference being that data is normalised in this implementation. The FLC can only operate when its 3 main components are loaded. The FLC status list box at the bottom of the form displays the FL process. Note: Input data must be normalised to the [-1; +1] range, the output will also range from -1 to +1. In the current implementation, only 3 types of membership functions have been coded: Shoulder-Right (black line above), Triangle (green), and Shoulder-Left (dark green). That should suffice for most situations. It is not here permitted to change the number of fuzzy states, but one could theoretically delete the fuzzy sets, create new ones, or just leave the FS unused. The underlying classes allow that. Changes to the grid are applied to the Fuzzy Set when the “Save” button is pressed. This dialog is quite simple. A variable can only be an input or an output, and a fuzzy set is associated to each variable. Variable names can be changed. The Number of States is read-only in this version, but a Fuzzy Set can be dropped, or changed. Please note that a Fuzzy Set attached to a Variable is copied into it. Subsequent changes to the Fuzzy Set are not reflected to the variable until a new association is effected. As said before, rules could be complex, using different fuzzy Boolean operators on more than 2 premises. In our implementation, rules are made of 2 premises and 1 consequent, and the Boolean operator is a fuzzy AND. This makes rule handling easier. The rule matrix is here fully defined and symmetrical, as often is the case. Again, rules use premises in the form of an association of variables with a fuzzy state. A rule set therefore closely depends on the variable set, and again subsequent changes to fuzzy sets are not reflected in the Variable Set, or in the Rule Set. a premise being composed of one or several antecedents. In our model, for simplicity’s sake, each antecedent is called a premise. This does not compromise calculations at all. FS, VS and RS are defined, so we can now start calculating fuzzy outputs. V0 is the 1st variable. It has been associated to Fuzzy Set FS1, and each fuzzy state is evaluated. Each rule is now evaluated. Since premises are already indexed, this process is quite straightforward. In the example above, Rule 1 is composed of Prem0 = 1 and Prem1 = 4 and a Fuzzy AND is applied to them (using the common Min-Max convention). The Fuzzy centroid is calculated using the Root-Sum-Square Method, which is one of the most balanced methods. It is also theoretically possible to inhibit or cap specific rule or rules. The Seattle Robotics provides ample information on this if needed. This is a very basic implementation of an interesting object model. FLC can now be easily assembled into more complex problem solving tools. A derived class will now be used to implement sequences, etc in a State Machine model still under consideration. It is also possible to now add a data input module (file read) and apply Genetic Algorithms to optimise some or all of the FLC components. Some experimentations of mine (using Ward’s GeneHunter) will be released soon. Note: The default Fuzzy Sets and Rule Sets conform the tutorial examples.